U.S. Army Spc. Brandon R. Romero of Los Alamos, N.M., and U.S. Army Staff Sgt. 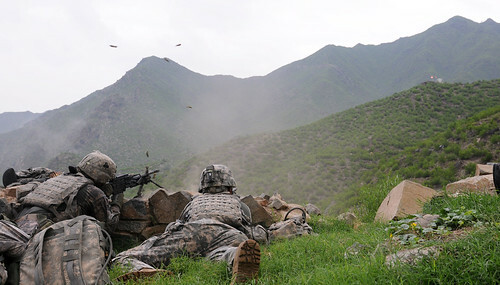 Glenn K. Luce of Midwest City, Okla., with Company A, 2nd Battalion, 327th Infantry Regiment, Task Force No Slack, open fire on a nearby building during an Aug. 18 attack against troops visiting the village of Spinkay in eastern Afghanistan’s Kunar province. One U.S. Army Soldier was wounded during the insurgent attack, which included the use of mortars, small arms fire and rocket-propelled grenades against International Security Assistance and Afghan National Security Forces.